I really love the snow, I really do. I want to get hit with a lot of snowstorms this year and I want to get snowed in. (As long as nobody has to drive in it!) It reminds me of when I was a kid and school would cancel and we were in our pajamas all day, drinking hot chocolate, watching the snow fall, and then, jumping in the snow and having so much fun! Now, I don't care for playing in the snow to much now lol. Mainly, because, I can barely move when it is warm outside and when the cold hits, I am pretty much stuck in my pajamas, trying as hard as I can to make the pain disappear, even just a little. But, my kids are having the time of their lives out there and I can't stop laughing at them running around with their bright red noses and their bundled up, sumo wrestler bodies, making snow forts and snowmen. If I have to choose one thing I can't stand when winter comes around, (other than driving in a blizzard or on ice. ), I would have to say that I do miss the fresh air more than anything! I run outside a lot during the winter, just so I can smell the fresh air and I feel like I am actually airing out part of the house when I do this. Yes, I am a little weird I guess. I stand at the door, waving it back and forth real fast before my husband sees me and yells, "Shut the door! We're not paying to heat the outside!" But, I NEED open windows, curtains floating in the breeze, and fresh, clean, crisp air. So, I do my best to scent the house as best as I can, so that I am reminded of warm, sunny days and the pleasant aroma of just washed laundry with fabric softener, wild flowers, and maybe a spring shower. 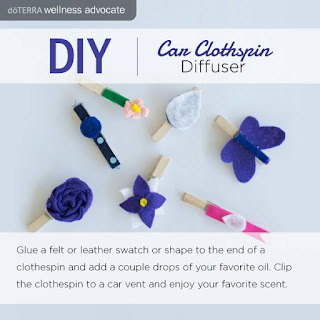 I do this by making candles, wax tarts, scented oils for oil burners and making my own carpet refresher, fabric refresher, and air fresheners, with essential oils. Well, I am sure you know where I am going with this! Don't forget to check out the cute idea in the image above! I am going to be grabbing a few packs of clothespins this weekend and we are including these car diffusers in our teacher gift baskets this year! Good luck on the giveaway!! I do not have a favorite yet.. but I do like the lavender scents. WubbleX Is Really, Really, Really Cool!! Swaive Ear Thermometer And A Giveaway!